An open letter to members of Occupy Wall Street. You are not the first to stand up to the system, but you may be our last hope. Your convictions are deep. They have made you courgeous and tough. You have proven you have the grit to prevail, but, as you well know, you are waging the underdog battle of all time – on an uneven field – and the general population is being led by shills for the 1% to believe that your weapons are firing blanks. We wish to offer you aid. There is a way that you can reach high ground, where you will be able to load your ideas with live ammunition in the full light of day. If it’s true that “the pen is mightier than the sword,” it must also be true that ideas are mightier than money. (Edward Bulwer-Lyton, 1803-1873, from his play Richelieu, 1839, Wikipedia.) But as in the 19th century a pen could not have parried a sword thrust, so in our time ideas about economic, social, racial, and environmental justice cannot germinate and push to the light through piles of money. The reasons ideas promoting justice do not enjoy a widespread cultivation are that the current, predominant thinking paradigm, the academic/scientific, cannot be used to convincingly articulate them, and it allows the 1% to use the system against all opposition. The academic/scientific thinking paradigm holds reason as necessary and uses it as dominant, and considers intuition as nice but not necessary. Your ideas, like the paradigmatic theories of our greatest scientists, Copernicus, Galileo, Newton, and Einstein, were discovered in intuition. What is discovered in intuition cannot be articulated through reason alone. But it can be revealed in a way to satisfy reason and advance justice. When we agree to debate the issues or form an agenda while depending on the academic/scientific thinking paradigm, we agree to rely on reason, and on experts and expert information, when the problems you are confronting require wisdom and the wise. Reason brings only expertise; only intuition can bring wisdom. You will find that, if you use the thinking paradigm of the great scientists, when you ultimately apply your intuition to the “what” and “how” of the issues of your concern, the “why” will be revealed. With the “why” comes wisdom; with wisdom comes a way to justice. You can gain this thinking paradigm by reading this blog, but you must read it entirely. If you elect to pass, please keep your eyes on the prize. You and your comrades may be our only hope. Know that many of the silent majority are for you, doing what we can in our own small way. While the shills for the 1% try to undermine your efforts by clouding the issues and diverting the attention of the general population by dismissing your efforts with insults, do not despair. The path exists! It is in front of you, hidden under the money, kept there by the academic/scientific thinking paradigm. I am not in the trenches, and have not earned a place in your conversation. But I have been concerned about the system for a lifetime, and sincerely believe I may be of some small service. From occupywallst.org comes the statement that the problem is not with people, but with the system. I would like to share some discoveries about the system – and thinking paradigms – that you may find useful. I would feel much more comfortable if we discussed them casually over a few beers under a shade tree in a city park. This blog will have to do for now. To compound my poor manners, not only am I inviting myself in, I will have to dominate the conversation for a while, and what I have to say will be impossible to understand until I swing back in a circle – a big circle – that will crystallize a picture of the nature and essence of the system, and complete a description of a thinking paradigm that will help you use that picture to focus your projects. It gets worse. Not only will you not be able to understand what I will say until I’m almost finished, I have to start with a confession. I am not trying to sell them, but to place my contribution in context, I have to tell you something about a two-volume set of books I have been writing over the last four plus years that is relevant to your cause: Prewired/Unplugged, Volume I; Improving Abilities to Learn and Create by Connecting to Potentials, A Guide for Parents, Teachers and Individuals; and Prewired/Unplugged, Volume II, Meaning and Truth. They are copyrighted, but not yet published. The purpose of the second volume is to piggyback on the first in order to provide the impetus and the tools for such a crusade as yours. You have jumped the gun on me! I am so relieved. But I don’t want to wait to weigh in until the books are ready. The first volume will help readers to develop a picture of thinking in general as an organic whole, with a picture of their thinking as an organic whole suspended within it. In the process of developing this picture through intuition and personal insights, readers will connect to their learning and creating potentials, and develop the ability to use them at will. With the ‘big picture’ of thinking a reader would have the ability to help others to develop their own big pictures of thinking to connect to their potentials. The book is especially designed for individuals with so-called learning disabilities, and/or problems creating. The upshot of developing the big picture of thinking is that an individual can use it as a map and a guide to expand their own thinking to utilize both reason and intuition in ways that are balanced, complimentary and complete. To use thinking that is balanced, complimentary and complete, an individual must use a specific thinking paradigm. In addition to helping to clarify the nature and essence of the system, I wish to introduce this thinking paradigm to you, and demonstrate how you can use it to advance your objectives. Without the process incorporated in the books, I have to say that you will have to make some giant leaps over wide chasms in order to adopt and use this thinking paradigm. I have faith that you will be able. But I don’t plan on leaving you with feathers and wax. After all, even though I will be forced to dominate the start of our conversation, to be successful, a conversation must include everyone. My goals in writing the two books are to place the appropriate tools in the hands of anyone wishing to improve abilities to learn and/or create, and to aid anyone wishing to use those tools to move authentically in their worlds with the ability to find true meaning, which will empower them to impact their worlds. I believe that you may wish to have that ability. If that is so, then with your participation in the conversation, I may be able to pass those tools to you in this blog format. The system you are trying to confront is the same system that I heard Tavis Smiley and his friend Professor Cornel West recently rail against on the Oh’Reilly show. (If you are Irish, please excuse my rudeness. I must have caught the tendency from thinking of the broadcast.) Oh’Reilly sneeringly dismissed them with a couple of statistics that he claimed meant that the poor have only themselves to blame. Mr. Smiley and Dr. West had no comeback, and were sent packing to look for incontestable factual evidence of criminality on Wall Street. It is the same system that was confronted by my generation, the first wave of baby boomers. I think those just ahead of us did most of the initial work in moving against the Vietnamese war and demonizing the system, and many baby boomers who came after us contributed. I don’t know because back then I was mostly oblivious to political and social issues. Most of my group, at least the males, were probably like me (born in 46, graduated high school in 64, draft eligible in 65); drafted before we even heard of such a thing as demonstrating against the war in Vietnam (I ended up in the Air Force), or putting your life on the line for civil rights. Some good things sprouted along with the flowers that demonstrators planted in the business end of National Guard rifles, and civil rights activists earned signficant gains with their courage, pain, and blood. But much was left incomplete, and, as flowers wither and turn to dust, and land left untended eventually returns to a natural state, much that was extracted from control of the 1% has returned to them. Your generation, marshaling in the streets in many cities, may be the last with any chance of making permanent inroads into the system. But without a new thinking paradigm, you will not have any better chance of success than did your predecessors. Numbed by the murders of the three creative geniuses who courageously stood up to stand in front of us, whose insights and courage had inspired us and showed us how to discover our own paths to promote positive change, and at a loss without them while simultaneously distracted by the growing demands of daily life, it looked as if many of us were sewn back into the quilt of society. We were, but did you ever notice those bright tie-dyed splotches that didn’t quite fit, or the not quite geometrical sections of faded jean material with frayed edges, or the sharp-edged, pressed squares that at first seemed to conform, but on second look not quite? Over the years you would have found them, side-by-side with people of all ages, working individually, or volunteering in national and international organizations that continued to make a positive impact on social and environmental issues. From a long and growing list comes to mind the Sierra Club, Nature Conservancy, Citizens Climate Lobby, various indigent defense funds, and, operating independently, hoards of attorneys who contributed hundreds of hours yearly pro bono, and medical professionals doing the same. He must have meant us – the people, all the people, the 99% and the 1%; he meant the land, the earth within her borders; he meant the water, which is in a constant connection to water around the planet; and he meant the air, equal with the water as part of the whole, a whole that constantly seeks to balance out. The air attempting to reach a uniform temperature creates all the weather. If all the air in earth’s atmosphere had the same temperature, the weather would remain constant. Here in Oklahoma, we know about temperature differences. It is the temperature difference between frigid air from the north colliding with hot, humid air from the south that creates our famously severe weather. To take advantage of this seasonal collision of air masses to study tornadoes, and wanting to locate where it could view the activities by looking out the windows, the National Severe Storms Laboratory built its facility a half-mile from my house, a distinction I could do without. Weather issues aside, the concerns of the baby boomers – perhaps I should say the concerns of the Kennedy Generation? – for the people, the air, water, and earth have continued in various forms unabated, at least since John Kennedy made his plea as the central message of his inaugural address. And now you have arrived on the scene. You should know that you are not alone. Look at your ranks. Many baby boomers – scratch that, many members of the Kennedy generation – are there. You can benefit from the advice these old campaigners can offer. I hope you can benefit from mine. But if you cannot, I hope you can at least enjoy a peaceful home-brew while you take time to see. Whenever a debate turns to owner/worker relationships, open shops verses union shops, racism, discrimination, poverty, criminality of the 1%, the environment, those advantageously using the system always win, or they are able to cloud the issues sufficiently to prevent their defeat and confuse the general public. Our legal system actually allows this to happen. Not too long ago the courts dictated that the publication of a government report about the hazards of exhaust from diesel motors in small spaces (coal mines) be held up for ninety days, so that a coalition of mine operators could look at it first. According to one of the articles I found on the issue, this allowed the scientists on payroll of the coal mine operators group to spin the facts in whatever direction they wished before publication of the report. Demonstrations (like Occupy Wall Street) and documentaries (like Tavis Smiley’s about poverty and the poor) are necessary as a first step to impact the power of the 1% who use the system to advance their vested interests. They are necessary to inform the mind, but they are not sufficient to awaken the heart. You cannot change a behavior or a belief through information in any form, least of all in the form of statistics, which shills for the 1% try to force you to present. That is why people have difficulty changing their destructive diets, stopping their habit of smoking, and so on, even though they know the negative impacts. On the other hand, the 1% are able to use statistics and misinformation to manipulate us, the 99%, to act against our own interests. They have many tricks. One is a magician’s trick of distracting us from looking to closely at spurious information studiously given, by loudly promoting a different, irrelevant issue that supports our self-interest in another area that doesn’t threaten. That is how experts on payroll to the 1% can offer bogus statistics and evaluations, and we accept it even though we doubt its veracity, not realizing that in the process we are manipulated to act against our own self-interest. In order to impact the system, by impacting the hearts of the silent majority, you must recognize and accept its true meaning. What is the true meaning of the system? There are plenty of sources that can help answer that question. We can begin with an excerpt from the publisher’s note in John Hersey’s book, Hiroshima. Any communication requires that everyone involved use the same definitions of the words that are used, and that they all attempt to find the true meaning of what is under discussi0n. There is no communication between the shills of the 1% and supporters of social and environmental issues, because true meaning is never part of the conversation. It is always about the vested interests of one side verses the vested interests of the other. The possiblity to advance social and environmental issues hinges on turning the debates into an honest search for true meaning. To find true meaning, a new thinking paradigm must be adopted. The true meaning of a ‘phenomenon,’ like the system, can be communicated through a totality composed of three different elements. Only totalities can be absorbed into the heart. To present the system in a form that can be communicated as a totality, three elements must be found, the what, the how, and the why of the system. Then you can describe what the phenomenon is (which you are partially accomplishing with your demonstrations, and Tavis Smiley has begun with his documentary on poverty and the poor); next you can state how the system is what it is (some of this you and Mr. Smiley also have done); and finally you must relate why the system is what and how it is (until you have a picture of the system as a whole, with a picture of the how of the system suspended within it, this is not possible). With the why comes wisdom; with wisdom comes a way. We should recognize that the descriptions by John Hersey and the publishers of Hiroshima are incomplete. The how of the atom bomb is much more than the scientific and technical information, and the what involves not only those upon whom the bomb was dropped, but those who dropped it. The how also involves the interest in such a weapon, how the project was organized, and the process that evolved into the decision to drop the bomb on civilians, where to drop it and when, and a whole lot more. The goal is to uncover the what, how, and why of the system, and create a way to present it as an organic whole, or totality, in such a way that it is represented in pictures in the imagination of listeners and readers. Only in pictures represented in the imagination can an organic whole reach the heart, and change it. Changes in the human world come only when hearts change. You will not persuade anyone by arguing for your vested interest, no matter how universally right or moral it is. Only by presenting a picture of the system as an organic whole will you open the hearts of most of the 99%, and find the wisdom to carry out your goals. When the system is seen as an organic whole, it will be visible in its ultimate true meaning. And you and the rest of the 99%, individually, will simply see what comes from that insight. Each will find a piece of wisdom. Each bit of wisdom, when communicated, will combine with every other bit and form a whole, a quilt, a multi-dimensional quilt composed of squares of wisdom contributed by each member of your group. Sound impossible? It is impossible – under the current predominant thinking paradigm. Only a new thinking paradigm will make all this possible. And the 1% do not have to change paradigms in order for you to use the new paradigm to reach your social and environmental goals. But it will not be simple, straightforward, or quick. We cannot find the what, how and why of the system by using standard methods under the current thinking paradigm, which is to say those we learned in school. We learned in school to evaluate the thinking of others, and to use it if it seems supported by evidence and if it appears to come from a certified expert. (Ultimately, to stand toe-to-toe with those who use the system, we’ll have to think for ourselves as well as be able to evaluate the thinking of others. Oh, just so you know, I am not a certified expert, except regarding carpentry and woodworking. You cannot believe anything I say about another subject just because I said it.) Although experts use the system and operate under its thinking paradigm, they do not, they cannot, understand it. Experts cannot discover nor elucidate the what, how and why of the system. That is because the system is an organic whole, and reason cannot perceive an organic whole. To perceive an organic whole, you must use intuition. Intuition would find that the system is a kind of organic whole that is a totality of qualities. An organic whole that is a totality of qualities is always composed of many participating totalities of qualities. To see a picture of the system that would be sufficient for your purposes, we need examine only two of these participating totalities of qualities, but we’ll have to use intuition to accomplish it. I will present some information in a form that can help your intuition come to the fore, and place your reason in a secondary relation. Of the two totalities that are necessary for the existence of the system, one is greed; the other is the current, predominant thinking paradigm. First greed. Ecological systems in nature survive through natural balance. In Long Island Sound, for example, stocks of menhaden (locally called ‘bunker’) go up and down on a yearly basis, and along with them, numbers of bluefish and striped bass fluctuate. During a year with a small population of bunker, fewer bluefish and stripers can survive the season in a healthy state, so the next year fewer bluefish and stripers are around to migrate through the Sound. Bunker populations rebound during that year because their stocks are supporting fewer predators. The following year, the increased population of bunker allows the migrating bluefish and stripers to prosper, bringing larger numbers of predators the next year, which severely reduce the bunker…and the populations continue to fluctuate in a direct relation to each other. Our economic system, to be “healthy,” requires continuous growth, which in itself should raise concern, since it is not natural, and requires that growth potential be infinite. The wishful thinking and the artificial nature of the economy aside, what do you figure is the trigger for economic growth? It’s not an intellectual decision made by every consumer and owner of industry; nor is it a natural function generated out of basic need. It is materialism, a materialism generated out of greed. Economic growth requires that the owners, the 1%, be greedy for profits, and that the rest of us be greedy for material goods. So, given the necessity of greed for a healthy economy, in order to improve the job market, we should not be marching down the sidewalks decrying the greed of Wall Street, we should be shouting from the rooftops, “Grab as much as you can.” But it does seem weird to tell our children to be fair and honest, and then not demonize Wall Street for picking our pockets. But, given the true meaning of the totality of qualities that we call the economy, that is precisely what we should be doing. On the other hand, while we should openly support the greed of the 1% while we preach to our kids to not be greedy, we should quietly be thanking our unions for keeping the economy going while stemming some of the greed of the 1%. I know, this sounds ridiculous. But is it any more ridiculous than the reality that a corporation, bank, or brokerage firm can take gigantic risks while jeopardizing the security of huge numbers of the 99%, while knowing that we, their victims, cannot let them fail, no matter how spurious, cruel, or unethical their practices? That the 1% has been successful in turning the general population of Americans against unions should indicate how stacked the deck is in favor of those who use the system, since unions are the only protection we of the 99% have against the 1%. And now, using the magician’s trick, we are letting the 1% distract us from watching their actions by firing us up to fear teachers (LIONS! ), and police (TIGERS!) and firefighters (BEARS! ), “OH MY!” Which reminds me of Kansas. In What’s the Matter with Kansas?, author Thomas Frank, I have heard, explores why people would vote against their own interests. I haven’t read the book, because, well, I have my own ideas on the matter. I mention Mr. Frank’s book only to support the idea that I am not the only person who believes that the 1% can use the system to manipulate us, while we are complicit but unaware. If we are contributing to the ability of the 1% to use the system to manipulate us to act against our own interests, wouldn’t it be a good idea to find out how and why? Why are we manipulated? Because we don’t realize it is happening. How are we manipulated? We are vulnerable to manipulation by the 1% because we “play” according to the rules of the system, and the 1% knows how to use them to their advantage. I realize that occasionally some individuals and groups are able to stand up to the system and bring about some good for the environment and for human beings. Take unions. I don’t have the stomach to describe the work environment in the United States before the advent of unions. I had a hard enough time reading The Jungle, Upton Sinclair’s 1906 novel of desperation and manipulation of the workers that described the working conditions in the slaughterhouses in Chicago during a period before unions. At the rate we’re going, we’re about to circle back to reexperience the way things were before unions. Read Eric Shlosser’s Fast Food Nation. Unions took some control away from those using the system, but the 1% using the system are confident that they will eventually get everything back. History supports their confidence. Or the 1% maintained their dignity and their position, but suffered new regulations on their industries. (Many of which Ronald Reagan was able to eliminate by convincing the majority of the 99% that they were being restricted by the government, and that everyone should be allowed to be free from regulation and the possibility of socialism, when the lives of the 99% were not in the least impacted by the regulations Reagan eliminated, oh, except that the quality of air, water, earth and manufactured products degraded, and contained more toxins after the regulations were dropped or weakened. Moyer’s doctor told him that had he been tested as a youth, only lead would have been found. I can’t provide credibility for the statements presented on Bill Moyer’s special. Citrations can be found by viewing the actual episode, which can probably be found on line. We have a small yard, so that, unfortunately, they can’t sustain a run. When I let them out first thing in the morning, the eighty-pound, dark brown brindle male chases the sixty-pound, white with two large irregular black spots and striped skunk marked headed female into a corner. He then uses his overwhelming size to hold her there. Cloud, the girl, stands quietly, looking around, disinterested in a feminine sort of way, completely ignoring Jock and his male posturing. But as soon as old Jock loses focus, slam bam thank you m’am; Cloud is off. And they can get off, in their prime at 45 mph in eight feet from a standstill. Old Jock jumps to life and leaps after her. Cloud will fake to the right (or sometimes to the left) at the vegetable garden, and then in the last possible second change direction and fly around to the left and around it. Unprepared for the move, Jock is unable to brake and turn, though he tries, so he boils up out of his skid and flies straight ahead and to the right around the garden, knowing, I guess, that they’ll eventually meet. Just before they crash head-on, Jock will flip into a 180-degree turn and fly back the way he came, with Cloud on his tail, trying to chase him into a corner. When she succeeds, which often takes three or more attempts, she turns and runs and Jock jumps after her. This game can go on for several minutes, the length determined by air temperature; to a point, usually around twenty-five degrees, the cooler the temperature the longer the game. Every morning, it’s the same thing. But I never get tired of watching, and I can’t watch without laughing out loud, and the beauty of it…Once, when Jock was playing tag with another female, Sunset, who we were fostering, in the middle of the game he jumped over her. She immediately jumped over him, then he jumped over her again. All this ballet at high speed while dodging objects in our tiny yard. So, like old Jock, we of the 99% are occasionally able to corner the 1%, who are using the system to their own advantage. But the 1% know that eventually we will lose interest, or motivation, or focus, or resources. On the other hand, they also know that if we continue forward, they can easily distract us or turn us against each other. In other words, those using the system against us know that they can easily fool enough of us that a large enough percentage of the population cannot be marshaled to populate a successful movement. And they have techniques that will hinder any strong movement from continuing indefinitely. I’m not talking about using the police illegally, which I have read happened to you. Does it mean that we are fools if we can be fooled into acting against ourselves? No. Well, then why do we allow ourselves to be fooled into hurting ourselves? It is because, well, there’s not a simple answer to this, which is another reason why the 1% using the system always win, if not quickly, eventually. We can say generally that we have been trained by our formal education (both public and private) to let those using the system manipulate us. Among other contributing factors, our education has trained us to operate under the current, predominant thinking paradigm, which dictates that we seek expert information and experts when confronting every problem, when the problems you are confronting require wisdom and the wise. Our training, and the principles of formal communication, demand that we operate under the current, predominant thinking paradigm, the academic/scientific. The academic/scientific thinking paradigm commands that we use reason as dominant, and considers intuition as nice but not necessary. Once we agree to use reason as dominant, we are forced to obey the rules of the system. One rule is to supply evidence, usually in the form of statistics, in order to support a position in a debate. It is with expert information in the form of statistics that your movement is being attacked, and you have no statistics with which to defend yourselves, let alone to mount your attack or counterattack. But no worries; statistics wouldn’t help you anyway. Before any words are spoken or written, every debate involving a social or environmental issue has favored those using the system, because once we recognize someone as an expert, we have been trained to give them the power to think for us. Instead of thinking for ourselves, we defer to the experts and hope for the best. Experts can be mistaken, and they can be bought off, or pressured to give spurious information. And experts, because they rely solely on reason, can deal only with quantities, while social and environmental issues are about qualities. Putting aside for the moment the fact that the sole use of reason is inappropriate for addressing social and environmental issues, given that we agree that our positions must be presented by a certified expert, when two experts appear to defend opposing positions, we of the 99% are left with the task of determining which expert to believe (they cannot both be right, though they can both be wrong). How can we ordinary folks determine what set of facts is right or wrong, true or false? How are we supposed to determine which authority we should believe? And what do the 1% have to do with the opinions of certified experts and scientists, all of whom, we have been taught, follow an unwritten oath to be honest? We don’t have to speculate to answer these questions. We need only look in the right places to find how the 1% uses the system to support their vested interests, and it comes with incontestable factual evidence provided by certified experts. Consider this from: www.ajph.aphapublications.org/cgi/content/full/92/1/14 (The American Journal of Public Health), “Attacks on Science: The Risks to Evidence-Based Policy,” January 2002, Vol 92, No. 1. American Journal of Public Health 14-18 (c) 2002 American Public Health Association. “For almost half a century, the tobacco companies hired scientists to deny first that smokers were at greater risk of dying of lung cancer, then heart disease and other tobacco-related illnesses, and finally to refute the evidence that environmental tobacco smoke increased the risk to non-smokers. In each case, the scientific community eventually reached the consensus that tobacco smoke caused these conditions. Despite the overwhelming scientific evidence and the smoking-related deaths of millions of smokers, the tobacco industry was able to wage a campaign that successfully delayed regulation and victim compensation for decades. The point that the 1% will manipulate and, well, lie in order to protect their greed has probably been sufficiently made, but at the risk of overcooking, please allow just a couple more references from Dr. Michaels’ statement. Here is a story from Dr. Michaels that brings us full circle, back to the coalmine operators and the government report on cancer. It indicates what the coal mine operators might try to do with aspects of the report, such as disputing the reliability of the method by which measurements were taken. By throwing doubt on one detail, they hope to throw doubt on the report as a whole. Dr. Michaels continues. “I’ll begin with a true story, involving research on a current regulatory issue, one of some interest to the members of this committee – control of diesel particulate exposure in underground mines…a consortium of mine operators…hired a well-respected scientist to do a study evaluating NIOSH’s exposure measurement methodology. “To his credit, the scientist refused to alter his conclusions. Even we playground perennials knew that if you are killed in a fire, it’s the smoke that gets you. By extension, each cigarette must be a little piece of death. Why do we wait for incontestable factual evidence (by the way, given some weaknesses in reason, there is no such thing) that would nail down changes in climate due to the burning of fossil fuels, when the best of meteorologists are restricted by reality to present forecasts for the following day in probabilities? Why are we letting ourselves be led to believe that we should continue burning fossil fuels until the evidence of climate change is “certain,” when we live in a closed environment, made so by the ozone layer that protects our precious atmosphere from being sucked into empty space? I mean, who doesn’t know you can kill yourself by burning fossil fuel in a closed environment, like sitting in your car in a closed garage, and running the engine? Speaking of closed environments, why are issues about environmental quality now focused on the climate, the most difficult variable to nail down? I actually heard an ad on television the other day that presented a car with “reasonable” fuel consumption and the claim, “Fewer carbon emissions is good for the environment.” At first, you think, yeah, okay. But then you realize, fewer carbon emissions isn’t as bad as more, but every molecule of carbon we produce through the burning of fossil fuels stays right here with us, just as it would in your garage. Why are we waiting for scientists to convince us to stop burning fossil fuels? Well, one reason might be that we don’t believe there is a crisis. Apparently, another reason we are reluctant to change our ways is that we are not free to perceive meaning that is true. Instead, we allow the 1% to manipulate us through our personal greed to retain what we possess, including our ability to possess more. And there may be something else that controls our beliefs and behaviors, something insidious, something hardwired into our brains that causes us to lie to ourselves in order to maintain our beliefs, such as the belief that everything is fine with the environment, which is how it appears to our senses (except when you notice the smog enveloping cities as you drive across the country, which we tend to perceive as isolated events). At least, that’s what a famous scientist suggests. In his recent book, The Ethical Brain (Harper Perennial, 2005), written forty years after he helped to create the first experiments with split-brain patients that uncovered facts about how the two hemipsheres of our brains process for meaning, Michael J. Gazzaniga, PhD, claims that just as our left hemispheres process information from our senses by organizing it in logical, mathematical, temporal, and linguistic forms, it also insulates us from true meaning that would threaten our belief systems. “No matter what…” If Gazzaniga is correct, we are greedy to retain our self-image and our beliefs, and we are aided by a structure in our brains. According to Thomas Kuhn, there is one thing that can cause us to change – the perception of a crisis. Rest easy. A crisis is not the only way we can bring ourselves to change. In Prewired/Unplugged, Volume I, I show that while Gazzaniga may describe what can be true for some individuals in laboratory environments, it is not necessary that it be true for anyone, especially in real world environments. Briefly, and without explanations: My dismissal of Gazzaniga’s theory is based on the phenomenon of brain plasticity. Our brains tend to develop structures and neuronal pathways to support habitual behaviors. If a person tends to live in denial, then their left hemisphere will likely develop a left hemisphere interpreter. If a person lives authentically, it will not. This is true by logical necessity. A person living under the influence of a left hemisphere interpreter can overcome it by adopting the new thinking paradigm we are heading towards. Through negative brain plasticity (what we don’t use, we lose), if a person elects to base behavior and beliefs on meaning that is true, then the left hemisphere interpreter would not be called into action, and it will, presumably, be absorbed into the surrounding brain tissue. The full explanation of my opposition to Gazzaniga’s universal application of his left hemisphere interpreter is contained in Volume I. On the other hand, if a significant number of us are under the power of a left hemisphere interpreter, it undoubtedly works in the service of the 1%, insofar as it prevents us from seeing true meaning, and causes us to choose for self-interest regardless of the truth or consequences. By adopting the new thinking paradigm, it would be possible to overcome a left hemisphere interpreter, if a person happened to have one. Based on his universal application of the left hemisphere interpreter, Gazzaniga has tried to capture human beings not only as individuals, but as a whole. In the process of showing that his attempt fails, we will uncover a pathway to the new thinking paradigm with which you could defeat a left hemisphere interpreter (if you had one). With this thinking paradigm, you will not only be able to stand toe-to-toe with those using the system, you could actually get close enough to step on a few toes. Well, let’s look at one of these stories. If Gazzaniga is correct, and it is purely a myth, then we should not expect to find any meaning that is true in an ultimate sense. How about a story of origin shared by the world’s three largest, and oldest, religions? If I may be allowed, and will not offend, let’s look at Genesis as merely a story. In any event, I think you will see that whether it was written by God, inspired by God, or created independently by human authors, the story of Adam and Eve in Genesis of the Old Testament will contradict Gazzaniga’s theory that stories of our origins are merely stories, created with the insidious ‘help’ of the left hemisphere interpreter of some ancient ancestor with the intention of manipulating us towards specific beliefs and away from others (a practice with which the 1% are masters). I heard once that a very large percentage of Americans (I’m sorry, I can’t recall where I heard this, or what is the percentage, though I seem to remember it was a majority) believe the story of Adam and Eve is factual. I mean no insult when I say that for our purposes, it does not matter if Adam and Eve actually existed as described in Genesis. What can be enlightening for us is the part of the story that involves the thinking paradigm of the characters. As a Catholic by birth, forced by my parents to attend church regularly, I often heard the above passage uttered. I recall always thinking that it meant the apple from the tree would give the knowledge that God possessed, which is to say omniscience, and that God did not want us mortals to possess it, because we were incapable of using it properly, or because we were not worthy. It was only after studying the bible in a class at Sacred Heart University (Bridgeport, CT) in the fall of 1964 that I actually saw all the words of the sentence. Now some may quibble with a reading of the bible in a Catholic university. But Sacred Heart was ahead of its time, and operated independently of Catholic doctrine. Just as Gazzaniga claims about our stories of origin, I was told that the Old Testament was composed of stories with little, if any, factual basis, and that only the New Testament was historical. But consider my class just before theology. African-American history. How many universities and colleges can brag about providing an African-American history class today, let alone during the violent, uncertain days of the civil rights movement? While I was told that the Old Testament consisted of stories, I discovered that Genesis held meaning that was true in an ultimate sense. This true meaning is based upon recognizing that the tree of knowledge of good and evil is a metaphor for reason. How so? Reason is capable of perceiving only quantities. A quantity is something that can be measured or compared to something else. In fact, quantities can be arranged to hold the end positions on a range of possibilities. For instance, on one end of a range is good, on the other end is evil. Consider the Platonic Ideals. They are quantities because they make sense only when each is paired with its opposite; such as beauty and ugliness. How about right and wrong? Quantities derived through reason. How about the spatial orientations that are described by reason? Up or down, left or right, front or back. These are all quantities derived by reason, because while they may not be measurable, each member of a pair is understood only as it is compared to the other. Another characteristic of reason is that it breaks wholes down into component parts in the form of quantities. With reason, you perceive and manipulate details. Adam and Eve begin life in the garden without benefit of reason. We know this because they do not notice the details of each other or of themselves. If Adam and Eve are not using reason, and they are thinking beings, then what kind of thinking are they using? There is not a lot of choice. There are only reason and intuition. Adam and Eve begin life in the Garden of Eden using the same thinking paradigm with which we are all prewired at birth – pure intuition. We, and Adam and Eve, began life in a world where there is no concept of value, no concept of ownership, a world in which all is perceived as it participates in a whole. We begin our journeys through early development just as Adam and Eve presumably began life in the Garden of Eden – not connected to our potentials for reason. We are born prewired with pure intuition. After Adam and Eve have eaten fruit from the tree of knowledge of good and evil, they suddenly demonstrate that they have acquired reason. They can instantly grasp details. Only reason isolates and perceives details, which it does without reference to the whole. Reason perceives details in information from the senses. Intuition perceives wholes. Before eating the fruit, Adam and Eve saw each other as wholes, noticing no details. After eating the fruit, suddenly they are embarrassingly aware of differences between them in terms of details. They have gained reason, and lost, well, we will see what they have lost. Because we are made to communicate under the academic/scientific thinking paradigm, what you have recognized with your intuition, you must describe and defend with your reason, and that is where you run into trouble. What you have recognized with your intuition ‘in the moment’ about the system are qualities that participate in ‘organic wholes.’ A quality cannot be measured or compared. It cannot be made to yield to statistics. A quality exists only as it participates in a whole. Reason cannot perceive anything as a whole, and it cannot grasp a quality. Reason breaks wholes down into component parts, and in the process turns qualities into quantities. When you agreeably participate in a debate about social or environmental issues, you understand the issues through your intuition. You see them as wholes, organic wholes, organic wholes that are totalities of qualities. But to communcate them, you are forced to destroy those wholes. It is probably safe to say that many of the shills for, and members of, the 1% possess a personal thinking paradigm that is a version of the academic/scientific, which means that they will be using reason, regardless of what type of task they are performing. Not only will you not be able to communicate the system as a whole to them in a debate, if you are debating a shill for (or member of) the 1%, because he will be using reason, he would be unable to see the system as a whole. He cannot see any qualities. He only sees quantities. Because he would be using reason when he meets a stranger, here is an experience that a member of the 1% (a “one percenter”) might have. On a warm afternoon in early July, he is walking along one of the pleasant pathways in Central Park in New York City. Approaching him from the direction he is heading is a man a full foot taller than he, and half-again as wide at the shoulders. It is the height of summer, yet he is wearing a tattered winter coat and long, overlong, thick pants that cover his feet and drag on the ground. As he is about to pass by, our one percenter moves off the sidewalk and strenuously avoids making eye contact, quickening his step. In this encounter, the one percenter has used reason. He has not seen this man as an organic whole, as something living in the particular way that this man is alive, but as an object, a thing composed of quantities. He has abstracted qualities from the whole, and in the instant that he did, they became quantities, and the man as an organic whole was lost. The one percenter saw the man in terms of details, aspects seen apart from the whole and by which he made judgments about him. Once the man has been seen in terms of component parts, he cannot be built back together again as an organic whole. To perceive an organic whole as an organic whole, you must perceive it as such in the first instance of perception. Only through intuition can you do that. If your personal thinking paradigm is indeed an intuitive version, here is how you might perceive the same stranger. You would be using intuition in the first instance of perception. You would perceive him as an organic whole. On this July day, you may have just left from a visit to the Whitney Museum of American Art, and are teetering At the Edge of the World, brought there by the exhibit of that name (June 30-October 16, 2011), a show of eerie, troubling expressionist/cubist paintings by Lyonel Feininger (1871-1956). Feeling like the incredible shrinking man or woman as a reaction to his abstract, larger than life humanoid figures dominating apparently shrinking, dilapidated manmade high rise structures, shrinking and contorted like rotting carved halloween pumpkins within sterile, artificial environments absent of nature, you are suddenly conscious of being embraced by the living, natural world. From the fading edge of the dieing human world, you are suddenly transported into the center of a living, vibrant environment. You feel overhead and around you the enveloping canopy of trees; you feel as well as hear the cacophonic symphony of birdsong emanating from everywhere. Your awareness is arrested momentarily by the intrusion of the sound of a horse’s hooves clomping heavily on the pavement in counterpoint to the jangling of harness hardware. You do not identify the sounds, or their sources, yet you yourself are lost in them, in the sense that you are not present, but are a part of the whole. You are absent from your awareness. You have no sense of your self. You are not making judgments, looking at any objects, or thinking about your meeting at three or what you will eat at seven. The papers on your desk at work do not exist. You are only pure presence, filling the environment like so much smoke that is invisible, aware only of the qualities of your environment as they participate through you to create the whole – the immeasurable qualities that exist only as they participate in the environment as a whole. And then suddenly you see the “man,” and the whole disappears. The man has somehow called your attention, and controls it. You do not notice any details about him. You may not even notice that you have to look up as you look into his face, and unconsciously move a bit to your right to make room for him to pass. Then something else takes charge of your awareness, and the man disappears. His face dominates as it lights up, and in a response you cannot contain and are surprised by, like a yawn that emerges from your Being after you unknowingly watch someone else yawn, you smile. And you feel something. You feel time and space suspend, and something inexplicable passes between you, something not created by the man and not created by you, something that emerged out of the whole of the environment of which you are both contained, within the birdsong and the green boughs massaging the air in the breeze, within which you have both disappeared simultaneously, leaving only the afterimage of smiling expressions that stays with you long after you and he have passed each other by. Somewhere in Being and Nothingness, Jean-Paul Sartre describes a situational love relation. You have experienced such a one with this man, and he has experienced it with you. What Sartre would call the love of the situation is merely a name given to the whole created by the experience. Whatever the man passing on the path did, however and whoever he was, it was okay with you. Whatever you did, however and whoever you are, well, that was okay with him. 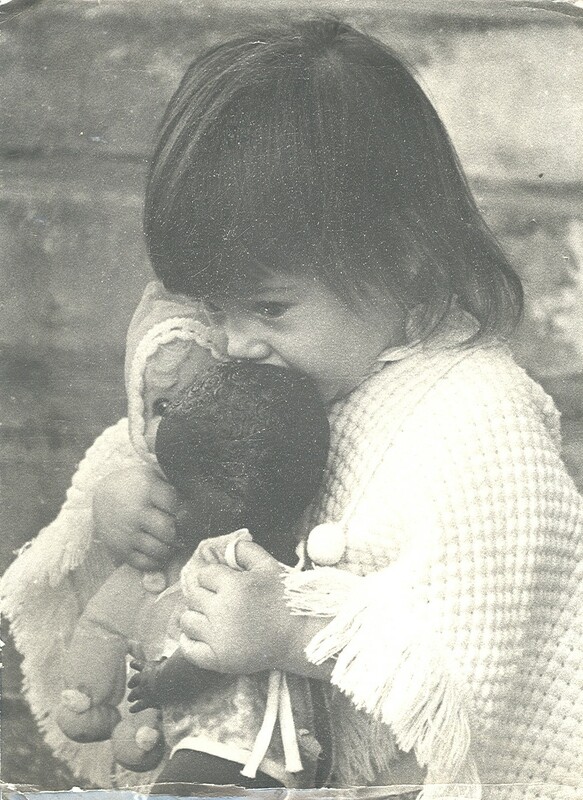 The photo above captures a love experience, between an innocent small child and her dolls. The eighteen-month-old girl is unaware of differences between her dolls. She only recognizes qualities. She doesn’t have a white doll and a black doll, she has two dolls, each with many different qualities. What could she be thinking, her eyes looking inward as she hugs her dolls while kissing one on the top of the head? What could she be feeling? Love, most certainly. Her dolls can do no wrong, nor can they do what is right, because she doesn’t judge them. They simply do what they do, and that is all right with the little girl. What could follow from such an experience of love when it is shared by two or more of us? Empathy. What could follow from the experience of the one percenter? Not empathy. Not sympathy. Not understanding. When you debate with a shill for the 1%, you are trying to communicate an organic whole, whether the topic is the system, the “poor,” the “deprived,” the bullied. You have experienced these organic wholes – as your representative in the story above experienced the man on the path. How do you communicate what you learned about the man on the path? That is what you must figure out –what, how and why to do – if you wish to call out the system and the 1% in such a way as to crack the hearts of all of the 99%. I cannot tell you the what, how and why. Each person must discover that for themselves. The new thinking paradigm is (almost) all the help you will need. We should continue along the yellow brick road that leads to it. Though it is unlikely, if any of the 1% or their shills are reading along, they have certainly relaxed. They see that we are heading toward a thinking paradigm that uses intuition as primary and reason as secondary. They know that it is a simple matter to show that intuition is unreliable, subjective, relative, and often irrational. Actually, not when you use the thinking paradigm of the great scientists. Here is a section I have lifted out of Prewired/Unplugged, Volume I, that will reveal some qualities of intuition as an organic whole, with an introduction to the new thinking paradigm. It may be a bit confusing, since I will not be able to fill out the overall context from which it emerges. “The biggest leap in the increasing advance of my thinking galaxy, within my expanding thinking universe, was due to unmistakable confirmation of a test of truth and validity I had discovered and incorporated into my designing process and the organization and execution of my work, a test that relied solely on intuition. In a philosophy of science class, I discovered that my test of my designs and my work was identical to a test used by some of our greatest scientists, which they apparently applied without realizing. ‘The inadequacy of evidence to support theories has already been addressed. But scientists seem to have a method for selection and discrimination. Their strategy is to use hypotheses of the very theory to be tested to compute values of other magnitudes from experimentally determined magnitudes. A simple hypthesis PV=kT may be tested by taking two distinct groups of measurements for pressure, volume and temperature. ‘One set may be used to determine the constant ‘k,’ PV over T = k.
‘The value determined for the parameter ‘k’ is then plugged into the second set of measured variables. In this way, the hypothesis pulled up the theoretical value by its own bootstraps, and in such a way that the computations can either instantiate or contradict the hypothesis. ‘In more complex theories, it may be possible for a value to be determined in more than one way. Computations of the same value, accomplished in two different ways, can confirm or disconfirm a hypothesis. There are, however, theories of a level of complexity which holds hypotheses out of reach of even the bootstrap strategy. ‘One stricture on testability is that the test cannot guarantee the results. Results must allow for disconfirmation, while actual values, in a valid theory, would be of a confirming nature. “While there may be some reason to quibble over whether Clark’s description of his insight about the bootstrap shows that its discovery and use by scientists involves intuition, it clearly involves intuition when I use it to test my carpenter work and to find a design. As a self-taught carpenter, I messed up a lot, often in the most basic of ways. “I began by relying on two independent ways to find a measurement for complicated pieces. If both measurements resulted in the exact same size, I felt confident going with it. I suppose this expanded out of the old saw; measure twice and cut once. My use of the bootstrap in designing is described elsewhere. “Some readers will undoubtedly be shocked to discover that intuition has a reliability that can produce a confirmation or a denial, and that reason and science have limitations. The developing picture of thinking will show conclusively that at least one of the tests of truth applied by intuition, of a type that I use in my designing and my carpentry work, was used by five of our greatest theoretical scientists, Copernicus, Gallileo, Newton, Einstein and Freud. They apparently believed that they were applying the hypothetico-deductive method in a standard way, but because of limitations to reason, they each opened the structure to intuition, and it was intuition that carried the day. “The use of intuition to test a scientific theory is only one surprise we find in the picture of thinking. To see others, we have to introduce a basic description of learning. “It is common knowledge that there are two different types of learning; learning supplied through reason and learning supplied through intuition. In the modern world, learning supplied by reason is what is required for success in the classroom. It is universally considered the only reliable source of knowledge. It is the kind of learning scholars and scientists are required by their certifications to use in everyday practice. “Learning supplied through intuition is considered unpredictable and unreliable, and is often dismissed solely on the grounds that to reason, it is subjective, relative, and often irrational. (For the moment, ignore the fact that intuition can produce meaning that is not true, and we will hold back the fact that reason can also produce meaning that is not true, even while it remains valid.) Because reason currently sits on the throne, we tend to believe what it tells us, and with its elevated status, it is in a position to throw rocks at intuition. But it cannot hit what it cannot see. “Reason cannot see intuition, and so is incapable of criticizing it in any valid way. The terms “subjective” and “relative” make sense only within a system designed by reason. Intuition does not fit into any of those systems. The only thing reason can say about intuition is that it is not reason. On the other side of the issue, intuition is not only capable of seeing and understanding reason, reason was discovered by intuition, and intuition continues to support it. “As you read the following excerpt, consider that science is the flagship of reason. “Edmund Husserl (1859-1938), The Crisis of European Sciences and Transcendental Phenomenology, Northwestern University Press, 1970, translated by David Carr, p. 121, copyright 1954 in the German, Martinus Nijhoff, The Hague. “Science and scholarship would be stagnant without intuition. Science, in particular, is presented as the discipline composed of a steady building up of knowledge since the early Greeks, as if it were an unbroken continuum built by interlocking blocks of facts derived through reason. But, in fact, our greatest theoretical scientists recreate science over and over again when, through the play of intuition, they discover paradigm changing theories. “With the help of an historian of science, Thomas Kuhn, we will see, within the context of the picture of thinking, how this occurred through the work of Copernicus, Galileo, Newton, and Einstein (we will accomplish this in a non-technical way that appeals to intuition). “The picture of thinking will include contributions by many others who, in the process of using intuition, discovered solid reasons to flip the relation of reason and intuition back to the natural state that existed before Socrates, and that exists for each of us during early development. By reevaluating human Being and science through this “new” relation, in which intuition is seen as primary to reason, Christian von Ehrenfels, Edmund Husserl, Sigmund Freud, Martin Heidegger, and a number of other modern philosophers and a few psychiatrists all used the same, new thinking paradigm to uncover new meaning of basic phenomena in thinking, science, and human Being (and we will use it to find new meaning in social and environmental issues). “When we hear someone grouse about how the modern world is impersonal, he or she is recognizing that human Being is excluded. Human Being is excluded because we live in a world tethered to reason, and reason cannot account for Being. Consider, for example, the dialogue ongoing in the neurosciences concerning the human brain, as it has materialized in a form accessible to us ordinary folks in twelve programs (the first series on the brain) on the Charley Rose show featured on PBS, all of which are available on line. “Every participant is a groundbreaking expert in their field, and each is committed to the sole use of reason in their work. They each seemed to want to explain human behavior as a function of two components, brain biology and environment. These are composed of elements that can be perceived by reason. There is a missing component. Not surprisingly, it is a component that cannot be perceived by reason. “Biology and environment are all that reason can perceive with any certainty (for the time being, we won’t quibble about the inability of reason to understand the interplay of environment on development, or to present information that is certain). To scientists, whatever cannot be perceived by reason must be ignored. On the other side, as you will soon see, the empanelled guests say that they believe in at least one more component in the equation, but they admit that they cannot account for it. “What is missing from the equation determines what, how and why we are. It is our human Being, the mechanism of our free will and individuality, it is the thinker and the thinking he or she uses to make choices. “The neuroscientists admit the belief in a third component in the equation by claiming that we are capable of free will, yet when they speak of it, it sounds more of a wish than something they expect to establish in fact. Belief in a third component aside, they seem motivated to find free will, from the standpoint that they do not wish to tell us that we are automatons, beings predetermined by heredity and environment, which is what we are if we do not have free will. “Some of us non-scientists, not constrained by the rules of reason, would say that, yes, free will is definitely available to us. It is necessary for the authenticity of our “soul,” “style,” “spirit,” or “Being.” But even we must produce something solid as evidence of the existence of authentic human Being and the free will upon which it would depend, but how will we if our brightest scientists cannot? “Simple. We’ll use a device made famous by the philosophers of linguistic analysis, such as John Austin, with whom we will visit in time. Listen to what we say to find out what we assume to be true, and the big philosophical questions will be answered. Just listen to any parent describe the kind of adults they would like their children to become to begin to uncover the esssence and nature of human Being. “We all want our children to grow up to be “good people,” with each child possessing a strong, honest character. When our children are responsible for themselves and their families out in the real world, we want them to be able to see what they need to do, and be capable of doing it. We want them to be able to know what they truly want to do with their lives, and be competent to do whatever they wish. These things we want for our children are all qualities, qualities of Being. They are not brain functions. “Here is a simple fact that is overlooked because of the emphasis on grades and scores on national standardized tests. Academic learning and thinking, which depend upon reason, do not make for a good life. They only provide the tools we can use along our way. What we learn in school are tools that allow us to learn and manipulate quantities. In this sense the language, logic, and mathematics we learn to manipulate in school, and the millions of facts we memorize, are not ends in themselves, but tools that allow us to accumulate and organize additional knowledge and skills that we can use to manipulate other quantities in the real world and in the work place. “Every year, students entering the dental program arrive with larger and larger libraries of knowledge in their heads, but in most cases, the librarian is out to lunch.” This from a friend whose identity I wish to keep secret until I have asked for and received his permission to quote him. He is a master woodworker, inventor, scientific investigator, a board certified endodontist and a professor in a dental school. “Academic learning and thinking – reason – is not capable of using the knowledge and skills it provides. For this we need intuition. Reason is a tool, and what it provides are tools. If your children are capable of academic/scientific learning and thinking, but do not have intuitive abilities, they can only be tool pushers. What we want is for our children to be tool masters, to have the ability to create lives for themselves by using intuition to control the tools, the tools of the arts and sciences, industry, entrepreneurship, scholarship, and technology. “We do not want our children to be dependent on others to create a job opportunity. We want our children to be capable of creating their own opportunities, even if they do decide to work for someone else. The most valuable employee is a tool master, one that is self-motivating and requires no supervision, who promises to do only what she is capable of, and who follows through on all her promises. “A tool master requires a full array of tools (here we are talking about reason), and the ability and experience to use the tools to solve novel problems and perform tasks. Reason alone is only a chest of tools that comes with no instructions. “Reason and its products are like the hammer I use when I build a house or a cabinet. The hammer does not build, it performs a function in the process. I use the hammer to fasten components together with nails, to smack recalcitrant boards into place, and so on. “It is how and why I use the hammer that builds the house or the cabinet. The how and why are determined by my Being (which is what, how and why I am), but are exercised through my intuition. My intuition discovers how and why I use the hammer in each instant within real world circumstances and environments, by keeping me, that is, by keeping my Being, in touch with the project as a whole. “The project as a whole is the projected final product, the house or the cabinet I have pictured in my mind. Within this picture I see myself building, blow by blow of the hammer, cut by cut with the saw. If I built a house according to reason alone, my thumb and fingers would be crushed by blows of my hammer. I would have to depend upon someone else to join the components. “As a carpenter, exactly as a basketball player is able to play the game within a lived picture of the court and all the players, I operate with my intuition. My intuition, for its part, uses the picture of the finished product that remains in my imagination as I work. The nail my hammer is approaching at top speed at any given time is in the realworld, but at that instant, it is also in a picture in my mind of the component I am building, a zoomed in picture that if I allowed it to zoom out would be seen as it is within the picture of the finished product as a whole. “(Please remember that you do not need to understand what you are reading. Just hang in there, and all of a sudden you’ll see in your mind and will relive an experience similar to the one you are reading about, and then you’ll shout, “Eureka, I get it!” That is how intuition works. And that is how you will tie a picture of your own thinking to the picture of thinking in general as an organic whole that you find in the text. “(You may not see yourself using a hammer and nail to build something. The description of using the hammer is meant to show the relation of Being and intuition when we use a tool of any kind. Reason is a tool. While reading about the hammer, the hope is that you saw yourself doing what you have done or wish to do that involves the use of reason as a tool. Perhaps you are a scientist working in a laboratory, using reason as a tool to test a hypothesis experimentally, using other tools such as laboratory equipment and glassware, and chemical components that you measure and control carefully by using reason. “It is through our intuitions that we each, as thinking beings, use both types of thinking and learning, our knowledge, skills, and experience, out in the real world, in the classroom, in the work place, on the basketball court, at recess on the playground, and so on. What we choose to do, and how and why we use our thinking, knowledge, skills, and experiences to do what we do are functions of our Being. If we seek meaning while operating from self-interest, our Being is not authentic, because the meaning we are able to grasp will only be meaning that is consistent with our self-interest. This is the kind of situation that would probably contribute to the development of a left hemisphere interpreter. When we seek meaning while greedily controlled by our self-interest, we are vulnerable to being manipulated by the shills for the 1%. There is only one way to protect ourselves: strive to develop Being that is authentic, and let your self-interest and greed go, and let things be as what, how and why they are, which is their true meaning. To succeed, you need only adopt the new thinking paradigm. There is only one way to protect your movement, and carve inroads into the system that is used so well by the 1%: let your view of the issues go, throw out everything you believe about them, and using the new thinking paradigm, see what meaning comes. Then you will be able to communicate the system and the issues as what, how and why they are. I believe that you are two-thirds of the way there to the new paradigm. I would be willing to bet that your personal thinking paradigm is the intuitive, that you use intuition as primary, which is to say, you use intuition in the first instance of perception, and you learn by insight. You follow up with reason to test your insights, and organize them for your use. The new paradigm adds intuition back in an ultimate step. Using intuition in the first instance of perception, as your counterpart did when meeting the man on the path, you will capture the what of any organic whole. Then by applying reason, you can derive the how of the whole. Applying your intuition to the what and the how will allow it to place them both in the same context, a context in which the how is suspended within the what. This new context, or new whole, will reveal the why of the organic whole. With the why, a new context emerges from the foggy edges of the context of the how within the what. The why contains the what and the how within it. This new context will reveal the meaning of the organic whole (the system, the “poor,” and so on) that is true in an ultimate sense. With meaning that is true in an ultimate sense – comes wisdom. To reiterate: The new thinking paradigm, which for lack of a better name I am calling the ultimate thinking paradigm, since it can bring us to meaning that is true in an ultimate sense, uses intuition as primary, reason as secondary, and then uses intuition again. Our greatest scientists used this paradigm, though since they were unaware that they were using the bootstrap strategy, they certainly must have been unaware that they were using the thinking paradigm we have been chasing. Consider Einstein’s experience when he had the insight about special relativity. The way I heard the story, he was leaving London aboard a train while he caught sight of Big Ben (the giant clock). As the clock receded into the background, he suddenly saw the relation between speed and time. This insight was not about quantities, but qualities. He saw time and speed join to create a new whole. He did not dovetail them together through reason. Only through intuition could he have these mental experiences that resulted in his theory. Then he applied reason, secondarily. Here is where he worked out the math. But then he had to try to devise a test. This is where he applied intuition as ultimate in the thinking process he used. He did this by using the bootstrap strategy. The way I understood Clark, Einstein deduced two hypotheses from his theory that, independently of each other, could find for the same variable. Some evidence in favor of the theory came when the two independent hypotheses did indeed produce the same quantity for the variable. Independence is not a characteristic of reason. Reason requires that all quantities in a given body of interrelated quantities be contained within the same system. Each of the two hypotheses was an independent system. Ordinarily, when a theory is tested by deducing hypotheses, the tests are circular (this is me talking, not Clark). The hypotheses, and the tests, remain within the paradigm created by the theory. Information gathered from the standard hypothesis has about the same value as defining a word with another word that means the same thing. I would guess that the great scientists, whom Clark Glymour discovered used the bootstrap strategy, must have known intuitively the weakness of the hypothetico-deductive method, and sought to strengthen it, which they did intuitively. Should we adopt the ultimate thinking paradigm because it was used so successfully by our greatest scientists? The reason the ultimate thinking paradigm was so successful is a better reason. It allowed the scientists to apply a stronger test of their theories then if they used the intuitive thinking paradigm. The intuitive paradigm would have allowed them to use intuition in the first intance of perception to discover their theories, and then they would have used reason to apply the standard hypothetico-deductive method to test them. But there are many other reasons to adopt the ultimate thinking paradigm. For one, since we all begin life prewired with a thinking paradigm that is pure intuition, and pure intuition can expand naturally into the intuitive thinking paradigm, which uses intuition as primary and reason as secondary, it seems obvious that the ultimate thinking paradigm is merely a natural extension of the intuitive. Natural is good, if it is not merely a buzzword. Here is another reason. The issues of your deep concern are organic wholes. To grasp an organic whole like the system and social and environmental issues, you must use the thinking paradigm of the great scientists, which we are calling the ultimate thinking paradigm. You can use it to, first, through intuition, discover the what of the phenomenon or organic whole of your interest (such as the system); second, you can derive the how of the organic whole with reason; and finally, you can discover the why with intuition. With the why, comes the ultimate true meaning of the organic whole within your realm of retained experience. With the ultimate true meaning comes wisdom, with wisdom comes a way to communicate the organic whole to others, and a way to act. All this occurs for individuals, since realms of retained experience are individual. But while the ultimate true meaning of an organic whole may be unique to each individual, it will synthesize with other ultimate true meanings discovered by others of the same organic whole – by association – as they exist within (as Husserl calls it) the intuitive surrounding world of life. By the simple process of synthesis, the wisdom we each can discover will bind with the wisdom of others, and create for us all a way to justice. But more than the thinking paradigm is needed. In order to perceive meaning that is true in an ultimate sense, you must let go of your self-interest and your goals, and let the issues be what, how and why they are. Here is how I accomplish this when I am trying to find designs for my patrons, whose homes I am remodeling. We consciously use the ultimate thinking paradigm, but with a wrinkle. We begin with reason. In our first meeting, I am met with a foot tall pile of magazine pages and pictures, which they show me while they tell me their feelings about them. I also check out the spaces we’ll be working on. My goal is to find limiting factors. One limiting factor we do not consider is cost. Our goal is to find the ideal design. Once we have found it, we can then make intelligent tradeoffs that allow us to retain the design (or perhaps the impression of it), while shaving expense. After the first meeting, I’m locked into the intuitive thinking paradigm. It’s intuition as primary, and reason as secondary. I work to let a design crystallize in my imagination. When anything shows up that seems promising, which in the beginning is not the design as a whole, but portions, like a given run of cabinetry, or the location and shape of an island, I then apply reason. I draw it up to scale, which has the serendipitous benefit of appearing as real in my imagination, complete with my patrons moving around inside in the space. This living representation in my imagination is obviously through the graces of intuition, intuition as the ultimate type of thinking in the process. If all goes well in my imagination, there is room for the refrigerator door to open, the washer and dryer fit, my patrons have smiles and are jovial, and everything, all the details, seem to disappear into the space as a whole, I present it to my patrons. If they love it, I then apply my form of the bootstrap strategy, a use of intuition to test my design, a design that I guarantee will be absolutely right for my patrons. My strategy is to throw everything out, and we begin again. (I do save the final drawings, for reference.) In this way, I take two independnt paths. If I end up at the same destination, that’s pretty good evidence that is where I should be. Usually, the pile of pictures is not as high when we start, and the limiting factors haven’t changed, but otherwise everything in the process is started from scratch. To find the meaning of an organic whole, which a design is, and social and environmental issues are, you must let the what, how and why of it come. You cannot make it come. If the design that crystallizes for me the second time around matches the one we discovered in the first go around, we move ahead to other phases that lead to building the project. If they don’t match, we start the process again until we discover two designs that match. There are other aspects to the use of the ultimate thinking paradigm when designing that aren’t relevant to us here. But there are two aspects of the ultimate true meaning of an organic whole, and the absolutely right design for a family, that you will find useful. These are that all meaning is contextual, and, it turns out that the largest possible context will provide meaning that is true in an ultimate sense. We can apply this to both social and environmental issues to find meaning that is true in an ultimate sense regarding the sticky issues. Take the issue of a river darter that exists in only one place, a two-mile stretch of river that happens to be where a utility company wants to locate a dam. The debate between environmentalists and the company usually degrades eventually to weighing a small school of fish against a thousand jobs to build the dam and power to five thousand homes. This is ‘reason’ placing the debate in terms of quantities. There is no empathy when reason is in charge. The idea is to find a context that will include all the contexts that are involved. Now suppose instead of debating the issue under the rules of the academic/scientific thinking paradigm, and instead of using reason to present the darters as quantities, the environmentalists decide to present the true, ultimate meaning of the darters, which is to say, they present the what, how and why of the darters by using the ultimate thinking paradigm. They use intuition to describe the darters in a way that the audience experiences them the way your counterpart was described experiencing the stranger in Central Park. The context of the darters is the environment, which is the river, but the river is what, how and why it is because of the environment through which it runs. And that environment is within another, and so on, until we find that the largest possible context for the isolated river darter is nature as a whole. Nature is a context that includes everything. There is no context that can trump nature, at least not within the confines of our atmosphere. The darters, their river home, the proposed dam if it were built, the homes to be powered, and workers themselves regardless where they are or whether they work on the dam, all are contained within the context we call nature. The meaning of the darters as organic wholes that are totalities of qualities is established by the organic wholes that they participate in. As Sartre said of the lemon and its yellow, the darters are nature, and nature is the darters. Of course, using reason, the shills for the one percenters would say, “Nature is not measurably diminished if we lose one type of river darter.” With this statement, the shills for the one percenters have driven home your message, and driven the darters into the hearts of the people. Now it is no longer a debate about a few fish verses a thousand jobs that runs around in the halls of reason, where empathy is not allowed. It is a debate about killing something that people can empathize with, killing a piece of Mother Nature, killing the last of a creature that, like the 99%, is part of nature. Nature cannot exist unless all of it is allowed to thrive. Creatures cannot exist if nature is not allowed to thrive. What does a dam do in comparison to that? I hesitate to mention this, but there is at least one person we all know who tends to appeal to the largest possible context as a way to communicate meaning. I hesitate because many, especially many of a particular political persuasion, will object and cry “foul.” Please accept this example merely as an example of a person relying on the largest possible context to establish meaning that is true in an ultimate sense. I am not making a political statement or advocating support for a particular person. With these conditions in mind, I give you Barack Obama – the man – not the president. I was alerted to Mr. Obama’s use of the largest possible context to communicate meaning when I stumbled across excerpts from one of his speeches. It is his commencement speech at Notre Dame University, I believe from 2009. I found it on: www.huffingtonpost.com/2009/05/17/obama-notre-dame-speech-f_n_204387.html. “We must decide how to save God’s creation from a changing climate that threatens to destroy it. We must seek peace at a time when there are those who will stop at nothing to do us harm, and when weapons in the hands of a few can destroy the many. And we must find a way to reconcile our ever-shrinking world with its ever-growing diversity of thought, of culture, and of belief. “In short, we must find a way to live together as one human family. “It is this last challenge that I’d like to talk about today. For the major threats we face in the 21st century – whether it’s global recession or violent extremism; the spread of nuclear weapons or pandemic disease – do not discriminate. They do not recognize borders. They do not see color. They do not target specific ethnic groups. It’s interesting. The Shawnee chief, Tecumseh, used the same meaning – displayed in the same context – to form a confederation of tribes in informal conflict with each other. If the greedy self-interest of his brother, Lowawluwaysica, had not been so excessive, resulting in catastrophe to the confederation, we might all be speaking Shawnee today. And if Tecumseh was still around to lead us, that would be a very good thing. Many of the issues that have brought you out would not exist. I put aside another speech demonstrating more clearly Mr. Obama’s use of the largest possible context, with the aim of including all conflicting contexts within it as a way of finding meaning that was true in an ultimate sense (which should satisfy all those involved on all sides, but under the current thinking paradigm, not yet), rather than using the standard method of playing steal the bacon for pieces in a compromise (which operates on the basis of cutting things up so you get a little and I get a little, and we both lose a little, and the whole is destroyed). Since I cannot locate it, I’ll turn to one of the heavy hitters, David Broder. Mr. Broder’s remarks are from Monday, December 14, 2009, The Norman Transcript, p. A 4, “What Obama’s Words tell us.” I hope to present Mr. Broder’s remarks while keeping them apolitical. As with our visit with Adam and Eve, we are only interested in the thinking. For us to find the largest possible contexts for the social and environmental issues, unfortunately, requires some additional information. Nothing less than the two volumes that are staring at me in manuscript form will convey it. But here is something that may be helpful. I hope it will be enough. If not, there is always another day. To combat the system, it seems obvious that you must be independent of it. The members of your movement who have been unable to find jobs must seek independence by becoming self-reliant. They can possibly improve their lot by adopting the ultimate thinking paradigm, with the aim of becoming tool masters, which requires the ability to use the ultimate thinking paradigm to connect to all potentials to learn and create. By following their natural curiosities, with the goal of finding and following meaning that is true wherever they are led, they may discover or create their own opportunities. From what I have heard flipping channels since his untimely passing, that is the process used by Steve Jobs (interesting name to have if you are a role model for finding work), cofounder of Apple. A tool master using the ultimate thinking paradigm may not create a multi-million dollar enterprise, but she or he will see something no one else sees, and will be able to build on their vision. Unfortunately, this process doesn’t put beans on the table immediately. It is heartening to read that your group functions, among other ways, as a giant support group. We know that “retraining” is a long process that doesn’t bring income until a job comes along, but these days, there is no guarantee retraining will bring a job. So, what’s to lose in trying to buck the system by becoming independent? With help, nothing. Without help, everything. When we bend to pull ourselves up by the bootstraps, we need a gentle hand to keep us steady. Chronically unemployed individuals have a different problem, I believe. I would guess that many suffer from so-called learning disabilities. I say so-called because persons having problems with academic learning are probably using personal thinking paradigms that are predominantly intuitive, and they are not connected securely to their potentials for reason. If you are not connected to your potentials for reason, you cannot succeed in school or in the job market. The process described in Prewired/Unplugged, Volume I, of readers developing a picture of thinking in general as an organic whole with a picture of their thinking as an organic whole suspended within it, would allow a person without analytical skills to develop them by expanding their thinking so that they could connect to their potentials for reason. But it is likely someone would have to guide them through the process, and it would not be quick. Perhaps you can set up a program, in your spare time…it’s my goal to continue working in the effort to help individuals connect to potentials to learn and to create, as soon as this blog takes flight. When we excel using academic/scientific thinking, but sacrifice intuition in the process, we become valuable to the 1% as a tool pusher, but we also become vulnerable to them. If they do not provide a place for us at the banquet, we will starve. There is only one way to become invulnerable: adopt the new thinking paradigm that allows you to connect to all your learning and creating potentials, so that you can become a tool master, able to use the tools of the arts and sciences, technology and entrepreneurship. We proceed by using free will (in spite of left hemisphere interpreters), and by allowing Being to be authentic, when we passively let Being follow our “master sense,” natural curiosity. When authentic Being discovers true meaning that leads to an insight, that insight is exactly the same as the paradigmatic theories our greatest scientists discovered. Just as Einstein’s theories of relativity changed Astro-physics, so can the insights an individual discovers through authentic Being change her or him. One of your tasks, as I see it from the outside, is to help the rest of the 99% – those holding back support or who are critical of your effort – to discover insights of true meaning about the system and the social and environmental issues, so that their hearts will open to the issues, precipitating a change in their Being that allows them to support your goals, while blocking manipulation by the shills for the 1%. When you get an insight, check it with reason. Use the three standard tests of truth as part of your test with reason: correspondence – does your insight agree with the facts so far as they can be determined; coherence – are the components of your insight internally consistent – that is, consistent with each other within the meaning of your insight as a whole, and externally consistent – consistent with meaning generally taken for granted as true in the real world; and utility – is it useful, will it carry the cargo. If your insight passes these tests applied by reason, subject it to the test applied by intuition; the bootstrap strategy discovered by Clark Glymour in the work of our greatest scientists, and used by me to create designs. Throw your insight out, let yourself go, and start again. With the same meaning as in the ancient saying (was that Zeno? ), “You can’t step in the same river twice,” you will not be able to follow the same path as you did originally, even if you wanted to. If you reach the same destination with your second attempt, that is pretty good evidence that your insight is based on meaning that is true. In the meantime, you should be aware of the context of your insight. If it is the largest possible context, then your insight is based on meaning that is true in an ultimate sense. Your greatest insight will be about the context. If you have the largest possible context for the issue of your concern, and it is the same context for your insight, then you can be confident that your insight will fly. In your second journey to true meaning, if the same true meaning appears to support your insight, you can then use the ultimate thinking paradigm (which entails the process just described) to discover what actions to take. When you have settled on actions, throw the list of actions away and start again. If the same list reappears, you can probably go for it. As you know, things never go as planned. But when your plan is the result of this method, you will find that you have maximum flexibility. That is because you have the largest possible context for meaning at your disposal, and whatever happens, it will be inside that context. There has to be one burning question. Just exactly where to start? The answer from reason is; in order to let your intuition come to the fore, passively let your mind wander as you perceive. This allows free play to your natural curiosity, and you can simply follow it. The answer from intuition is; you start from love. I don’t mean ‘love’ in the corny or sentimental sense. I mean you begin your journey to meaning that is true in an ultimate sense by starting in a love relation, just like the one described happening with the man on the path in Central Park. A love relation with a social or environmental issue? If you ask that question, you have not yet had a situational love relation with something. When you do, you will understand why the native Americans believed everything had a spirit (or a heart or Being). If you recall, in a situational love experience, you are without greed or vested interest, you are not focusing on details, you are simply letting the phenomenon present itself to you. Consider the commandment, “Love thy neighbor as thyself.” You might let your mind wander over what that means, with your ‘neighbor’ represented by a person you wish to know or help, or by an issue with the system. You must always start with the desire for a ‘situational love relation,’ whether you are interested in learning true meaning of an issue or a person, or a tree. A situational love relation, like that described above happening in Central park, is possible only when you let another (person or thing) be what, how and why she or he (or it) is. That is possible only if first you love yourself, by letting your hair down, by unselfconsciously letting yourself be what, how and why you are. Of course, that could possibly scare the hell out of somebody, but all you can do is all you can do. You have to be authentic for true meaning to be available. The good news is, if you are seeking true meaning about a particular social or environmental issue, then you won’t have to worry about frightening your subject away. Here is the bad news. Although I have gone some distance to describe the what, how, and why of the system, you will find that you won’t be able to use it without discovering at least some insights of your own. The same is true for the members of your group. They will not be able to fully commit to someone else’s insight. Each person has to discover true meaning through their own insights. They cannot gain it by reading it, or hearing about it. The amazing thing will be, when the insights are shared, they will magically coelesce into one whole, each insight will fly up and combine into a multi-dimensional quilt that will be the foundation of your group. One last thought. If the idea of a love relation with an issue like finding a job is just too weird, there is another way to get to the true meaning. You have heard of the Socratic dialectic, or Socratic questioning. It is used in many law schools to draw students into developing their critical thinking regarding the law. It is a tool of reason. There is another form of question that comes from intuition. It leads you where you want to go, before you know where that is – to destinations like true meanings that are not related to vested interest or greed. I call this type of question a “Buddy” question, after the man I saw using it, Bud Wilson. For several years, I was a board member of the Norman Optimist Club. Some board meetings, especially the ones involved with rules changes for our basketball, football or wrestling programs, could run into the early morning hours, unless Bud happened to be in attentence. Bud would let you do things your own way, but he wouldn’t let you fail. He wouldn’t bail you out or shove you aside to save the day; when he saw you were headed irrevocably the wrong way, he’d provide something unexpected that would lead you where you wanted to go. Nowhere was this kind of service more appreciated than at our board meetings, where a dozen women and men came to the table to make up rules and policies, each of us with a different idea about how things should be. Bud’s contributions at those over-lengthy gatherings is why, whenever I think of Bud, I think first of his voice. The reassuring voice that called us out of the wilderness; the whisper that silenced the deafening storm; the unerringly accurate murmur that lit up the bullseye when our well-reasoned attempts were wide of the target. And how was Bud able to calm stormy seas and guide us into port? Did he pour oil on the water and latch onto our bows and pull us in? No. Did he try to cajole us in? No. From somewhere deep within the gale, a confident, nameless voice would utter a question that would be taken up by the hot air we had produced – to permeate the room like the subtle, sweet scent of honeysuckle that clears the senses, a simple, concrete question that would silence our voices and suspend our thoughts, a question that would end in a harmonious minute – what had been a calamitous, endless meeting. “How will this affect the kids.” I think, I know, that if Bud were still with us, he’d be right there with you guys, and, over his beer and his infernal cigarette, he’d blink through the smoke in his eyes, and ask the same question. A dam or a few fish? How will your choice affect the kids? Taking away health care? How will that affect the kids? Let huge banks prosper on the backs of us ordinary folks? How does that affect the kids? You may be able to use a form of Bud’s pet question when you seek to find the heart of an issue, but most likely you will have to find your own. It will crystallize for you simultaneously with your discovery of the largest possible context for the issue. A Buddy Question, ultimately, leads to the same place – through true meaning – to peace of mind. Peace of mind… peace of mind would come if you could look into the sweet eyes of the innocent small child in the photo above and know that your choices promote her well-being. But if you (well, I doubt you need to hear this, but somebody does) if you wait until there is no controversy about issues like climate change and the burning of fossil fuels before deciding to turn off lights in the house that aren’t necessary, well I don’t think peace of mind would come of finally being conscientious about putting carbon into the atmosphere. If you are waiting for incontestable factual evidence for the obvious before altering your wasteful habits, you are using – excuse me, your left hemisphere interpreter is causing you to use – the lack of a consensus to indulge your greed. Indulging your greed will bring you pleasure, but it will not bring you peace of mind. And that brings us back to the problem of an economy that depends upon greed on both ends. Good luck, I’m anxious to hear from you.